A wholesome meal is important for a child’s overall development. It helps a child become smart and aspire high. The Akshaya Patra Foundation understood the need for a healthy meal. Since the year 2000, the Foundation has been serving children in Government and Government-aided schools. Akshaya Patra currently serves over 1.6 million children in 13,800+ schools across 12 states of India. Its school lunch programme, the largest such NGO-operated initiative in the world, is implemented with the support of the Government of India and various State Governments. Akshaya Patra receives support from many philanthropists and eminent public figures. 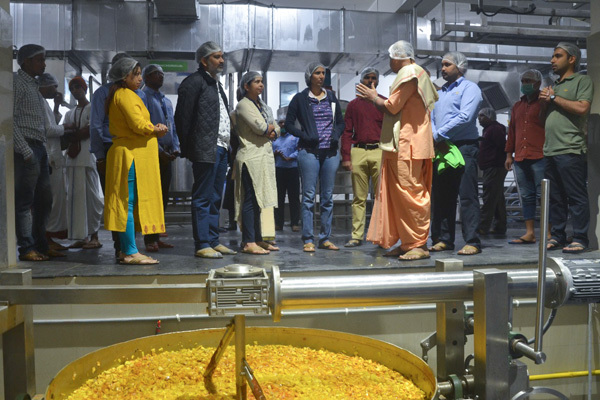 The producer, Mr Shobu Yarlagadda and director, Mr SS Rajamouli of the award-winning film Bahubali took a tour of our Narsingi kitchen on December 11, 2017. They were impressed by the entire process, scale, efficiency and dedication with which the meals are prepared and delivered hot to children. The kitchen at Narsingi serves over 65,000 school children. 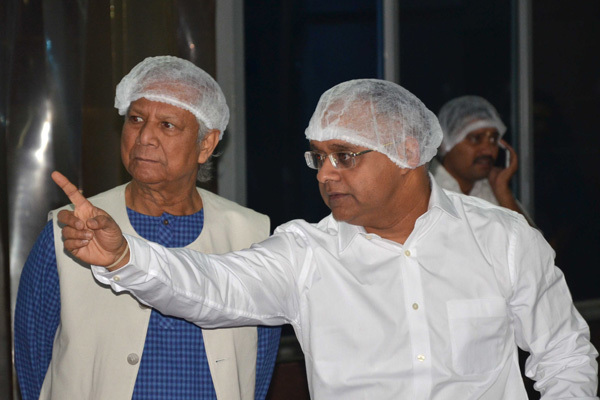 Professor Muhammad Yunus, Nobel Laureate, Founder of Grameen Bank, visited Akshaya Patra’s Hubballi kitchen on 7 February, 2016. He was accompanied by Mr Anousheh Ansari, Co-founder, Chairwoman and CEO of Prodea Systems and Dr ‘Desh’ Deshpande of the Deshpande Foundation along with others. He also lauded Akshaya Patra’s meals and said “children love the meals that is served to them”. 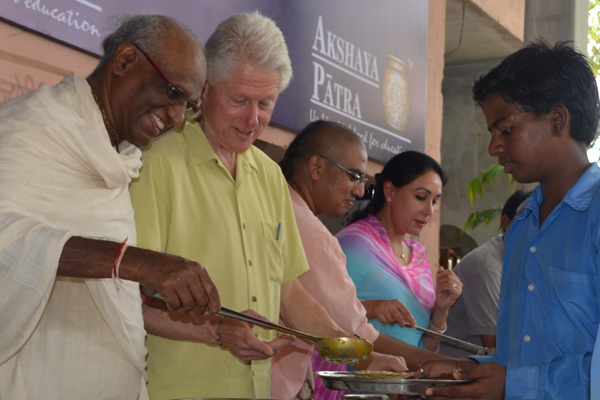 On July 17, 2014, Mr Bill Clinton, former President of the United States, visited The Akshaya Patra Foundation in Jaipur, Rajasthan, and went to a beneficiary school thereafter. Mr Clinton was very appreciative of Akshaya Patra’s work and was awed by the functioning of the roti maker machine. The students were thrilled to meet the Former President and talk to him. Some of the interaction with the students left him emotionally touched. The excited students also demonstrated some of their whiz-tricks in Mathematics. A cultural programme was held in Mr Clinton’s honour; he was delighted to watch it. 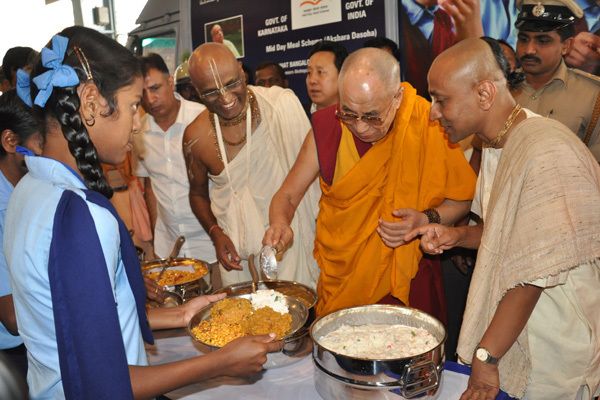 We were honored to have His Holiness the 14th Dalai Lama of Tibet visit our Foundation in July in Bengaluru, Karnataka. During his visit, he served meals to Akshaya Patra’s beneficiary children. He said, “I appreciate and express my gratitude for your real and benevolent practice, which is rooted in the fundamental spiritual principle of compassion, especially by helping the young children who are facing challenges in their physical and mental upbringing. I pray that you would continue your generous help to young and old people as long as their difficulties persist”. 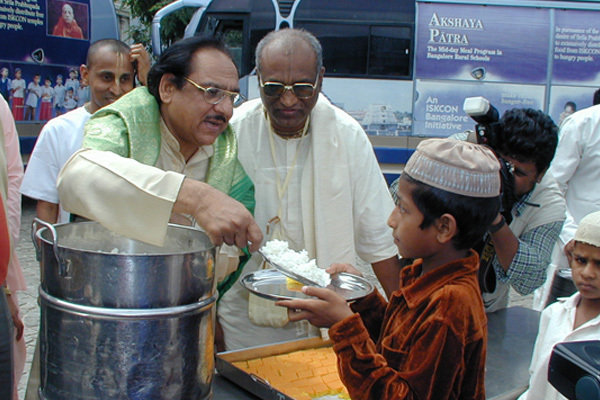 Gulam Ali, renowned Pakistani ghazal singer, had a meal with the beneficiary children of Akshaya Patra in Bengaluru. The Ustad called it one of the happiest occasions of his life. “This is one of the best such programmes that I have ever seen, with thousands of children benefiting,” he expressed. Dr APJ Abdul Kalam, the former President of India, paid a visit to The Akshaya Patra Foundation in Bengaluru. 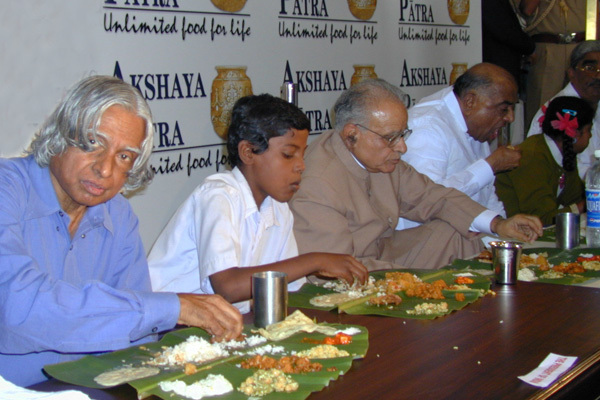 “When I entered the divine, beautiful temple, I turned to Swami Madhu Pandit Dasa and appreciated his power to spread the message and particularly giving food under the Akshaya Patra programme”, said Dr Kalam.